This warm cup of deliciousness is perfect for a winter day and won't give you a food hang over or a huge muffin top (unless you make it every day or something). You don't need much to make it (time or ingredients), which is pretty awesome! Being the crazy foodie that I am... 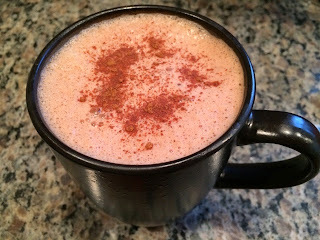 I decided to do my own experiment using a few different options of sweeteners to make the perfect dairy-free hot cocoa. I made 3 equal amounts of cocoa but used either honey, stevia, or pure Grade B Maple Syrup to sweeten them. Which sweetener do you think won the taste test? Of the 3, my husband and I both liked the maple syrup best but came to the conclusion that the very best combo is a mixture of both stevia and maple syrup. Try the sweetener taste test for yourself & be sure to let me know your preference! 1. Bring liquid to a boil. 2. Pour the rest of the ingredients into the hot liquid. 3. Whisk until frothy and enjoy! For fun, add a drop of peppermint or orange essential oil (2 drops of peppermint was too much for my taste), maybe a dash of cinnamon or vanilla and top with whipped coconut milk cream (the cream was a heavenly addition to mine)!